This guest article is written by Glenn Ackerson (above) who participated in a Gran Fondo Cycling Tours (www.gftours.com) bike vacation. "Look up the word “epic” in the dictionary, and you'll find definitions like "...surpassing the usual or ordinary, particularly in scope or size." Look up Passo Stelvio on the Internet, and you'll find it described as “…the highest paved mountain pass in the Eastern Alps, second only to Col de l'Iseran in the Alps in height.” Put them together, and you have the epic climb that is Passo Stelvio - a climb with more than twice the number of switchbacks (48) as the famous Alpe d' Huez (21.) 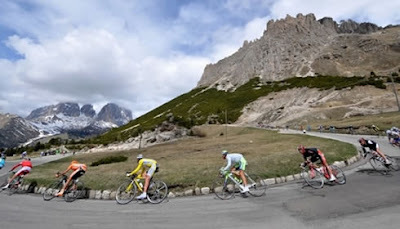 Add to that the elevation of the summit, 9,048 feet, and you have one of the Italian Alps’ most impressive and challenging climbs. The Stelvio is one of 3 legendary passes of that region featured in the Giro d' Italia, and you're likely to see the racers climbing it next to a bank of snow in the Giro, due to its height. On our Maratona tour, day 1 began with a bang - a chance to return to the legendary climb. I jumped at the chance to revisit, because where else in the world can you climb a pass of such epic proportions? Stelvio is truly a road that harkens back to the days before automobiles and before the massive tunnels that bore through the Alps on the straight superhighways of today. As we began the climb, I was thankful for the cloud cover, because it kept us cool. And, as the switchback signs began their count backwards on the ascent – 48, 40, 30, 25, 20, a light rain began to fall that I actually didn't mind, because when you're climbing, a light rain doesn't get you that wet. As we neared the summit, I realized that the rain had changed to snow, but it somehow fit perfectly into the epic climb that is the Passo Stelvio. 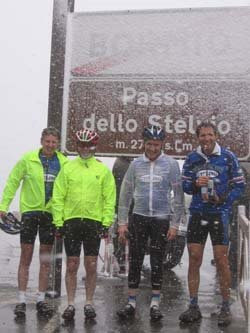 Where else but a pass like the Stelvio would you ride into the snow in July? As we arrived at the summit, with the anticipation of the traditional visit to the bratwurst stand, this light snowfall grew in intensity and suddenly, leg warmers, arm warmers and my rain jacket weren't cutting it; we were experiencing a true snow squall! The picture you see should have a caption like, "hurry up and take the photo - we're freezing!" I will admit to doing something after that photo shot and a coffee drink to warm up that I've never done on a tour before - taking a ride back down the mountain in the van. It's a ride like that when you appreciate a tour company with a van always nearby. 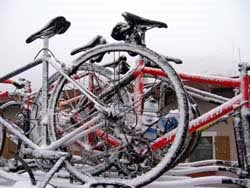 And, even the brave souls that descended before us on bikes, swearing to get in every last mile, soon jumped in the van, when the reality of the weather and the difficulty in feeling fingers with which to brake set in. The Stelvio, snow and all, didn't disappoint, and on this day, it lived up to its epic reputation." My thanks to Nick R. for submitting the following article which appeared in "The Florentine". Florence is not only the birthplace of Gino Bartali, one of the greatest cyclists in history, but it is the birthplace of the Italian bicycle. The velocipede was built by Florentine inventor Giovan Battista Gallizio, who made the two-wheelers from 1860 to 1880. Cycle lovers can catch a glimpse of this rare piece of history at the Museo di Ciclismo Gino Bartali in Ponte ad Ema (FI) until February 28. As part of the exhibit, entitled "From the velocipede to the bicycle", Gallizio's velocipede is showcased with some other very rare cycles: a late-1800s tricycle in iron and with different sized wheels, as well as two motor-run bicycles from the 1900s. The exhibit explores the history of the bicycle in Italy with the aim of ‘attracting more Florentines to the museum and to the sport', says the museum's director, Leonardo Petronici. Established by the Associazione Amici del Museo del Ciclismo Gino Bartali, the museum in Ponte ad Ema also holds an important permanent collection of cycles, jerseys, biographies and anecdotes of Italy's great cycling champions as well as an entire room dedicated to the titles won by Bartali. Campagnolo has launched a new contest where the two top prizes are trips to the gran fondo Maratona dles Dolomites as part of a dream team of Italian champions. "Being part of the Dream Team is a real possibility. By purchasing a Campagnolo 11Speed drivetrain or a Campagnolo 11Sportswear Speed set, you can participate in the contest and win your dream. The objective of great champions is to win, and with Campagnolo 11 Speed you, too, can set big objectives for yourself: to win a place in the Marathon of the Dolomites alongside the super-champions of the C11 Campagnolo Dream Team. Campagnolo has reserved two places of honour that will be drawn from among those who have purchased a complete Campagnolo 11 Speed drivetrain or a Campagnolo Sportswear 11 Speed set (Jersey + Bib). 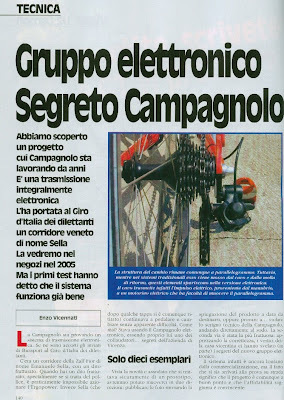 Campagnolo also offers prizes for the names drawn up to the 11th place." 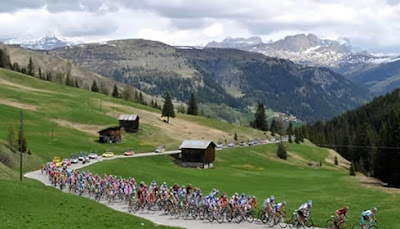 My multi-part story of the 2007 Maratona, and the funny story of meeting Greg LeMond, can be found by search in my blog under "2007 Maratona". FIRENZE (Florence), 23 February 2009 - The 44th edition of the Tirreno-Adriatico, the "race of the two seas", professional road race was presented here today. 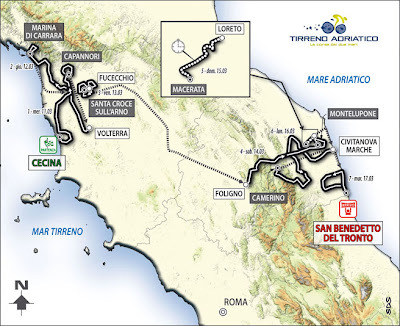 The 7 stage race, from 11 to 17 March, will begin for the first time in Tuscany. It's expected to be an important test for Ivan Basso as he prepares for the Giro d'Italia. The Tirreno-Adriatico also serves as an indicator of who will be the top contenders at the Milan-Sanremo one-day classic on 21 March. 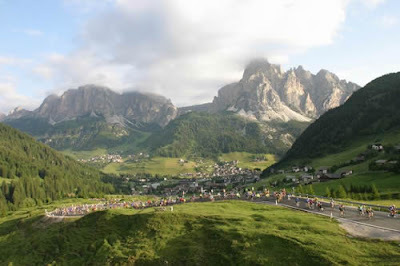 There is news regarding the Gran Fondo Dolomiti Stars. The event has now been moved from May to September (13 September) in order to have more favorable weather and when participants will have more KMs under their legs. The granfondo will also now begin and end in Arraba. The Dolomites are fantastic for cycling. 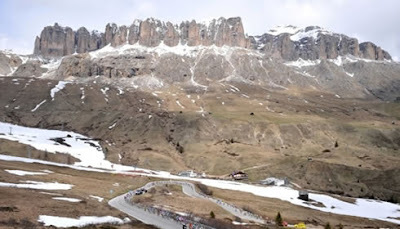 If you can't get an entry to the gran fondo Maratona dles Dolomites this is an excellent alternative. 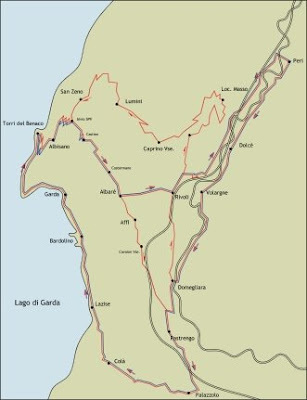 The gran fondo route will be 135 km and will include the Duran, Staulanza, Giau and Falzarego passes (ouch! 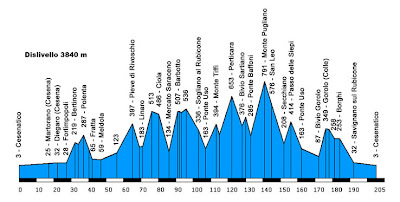 ), while the medio fondo of 70 km will climb the Giau and Falzarego passes. Vincenzo Nibali, who hails from Messina, Italy, was dwarfed by wild American fans at the Tour of California. In the final stage from Rancho Bernardo to Escondido he finished second to Franck Schleck. In the general classification he finished 6th. Campagnolo Gran Sport derailleur with a gold Regina freewheel mounted on a Hetchins with curly chainstays. Striking. 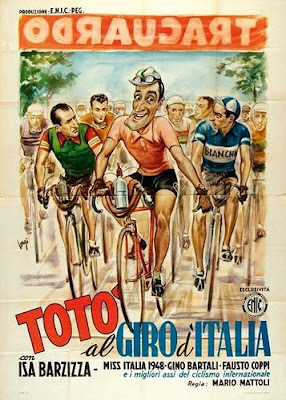 "Totò Al Giro D'Italia" is an Italian comedy filmed in 1948. The story line of the film is that Totò falls in love with the beautiful beauty pageant contestant Doriana. However, she agrees to marry him only if he wins the Giro d'Italia. To do this Totò has to win the Giro against Coppi, Bartali, Schotte, Kubler, Bobet, Magni and others, all of which are actually in the film. In this portion of the film Totò, wearing the Benotto jersey, presents himself at the start to receive his race number; he is preceeded by Coppi and Bartali. At the registration Coppi is on his left and Bartali to his right. In the racing sequence Coppi, Bartali, Schotte, Kubler, Bobet, and Magni all appear. Since the film was made in 1948 all the bikes are "period correct". I'm not sure if they are the actual bikes Bartali, Coppi, etc., would normally ride however. Anyone have an opinion? 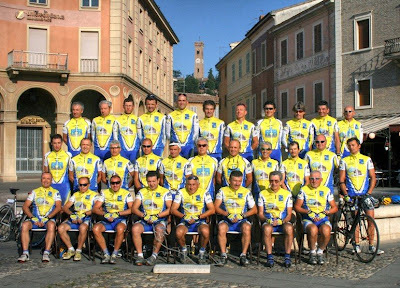 The Gruppo Ciclistico AIR of Santarcangelo di Romagna (Rimini) has organized a nighttime randonnèe following the exact 205 km course of the Gran Fondo Nove Colli (nine hills). 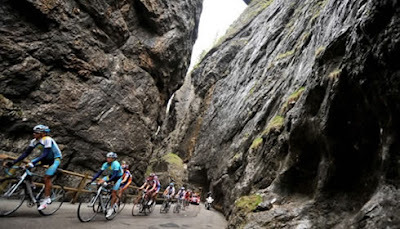 The Gran Fondo Nove Colli is Italy's largest cycling event, in part because of its start in the home town of Marco Pantani, attracting 11,000 participants. 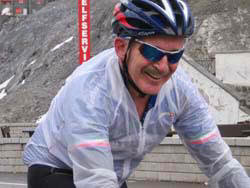 The "Randonnèe By Night sulle strade della Nove Colli", "Memorial Dario Beltrambini", is limited to 300 participants. Compliments to the Gruppo Ciclistico AIR for organizing a unique event. ATTENTION: Since I wrote this piece yesterday I have been informed that Campagnolo 11S is already warrantied for 4 years: (http://www.campagnolo.com/jsp/en/techinfo/index.jsp). 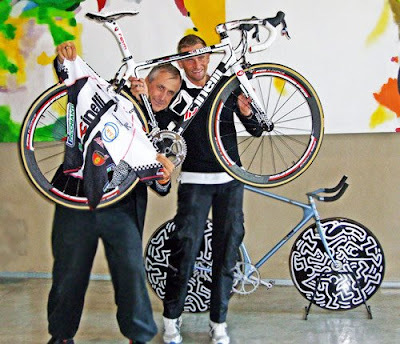 We congratulate the new owners of the Campagnolo 11 Speed! Owners of the Campagnolo 11 Speed drivetrain have the chance to extend their warranty from 3 to 4 years by simply registering on the website http://www.11speedowner.campagnolo.com/. To extend the warranty, register on the site http://www.11speedowner.campagnolo.com/. Enter the unique code provided by the dealer at the moment of purchase or alternatively the product codes and the serial numbers of the components of the Campagnolo 11 Speed drivetrain. On the site you will find a simple guide for identifying them correctly. Filling in the registration form is fast and simple. When you have completed the registration procedure the warranty will automatically be extended by a fourth year. By logging in you can print your certificate of warranty whenever you want. By registering on the http://www.11speedowner.campagnolo.com/ website the owners of the Campagnolo 11 Speed drivetrain also join the exclusive Campagnolo Club 11 and will be kept constantly abreast of all the Campagnolo novelties and initiatives for the 11 speed. 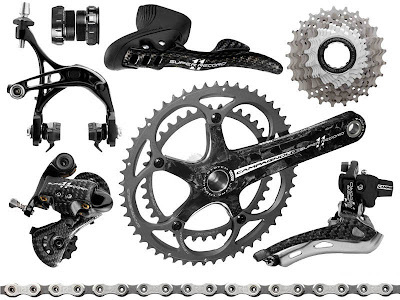 The only condition: the Campagnolo 11 Speed drivetrain has to be composed by crankset, Ergopower controls, rear derailleur, front derailleur, chain and sprocket set. Brooks was purchased by Italy's Selle Royal in 2003. The Brooks firm, located in Birmingham, England, employs approximately 20 people in the manufacture of fine, handcrafted bicycle saddles. A full range of saddles are available in the categories of racing and mtb, trekking and touring, city and transport, and heavy duty. Founded in 1866, Brooks was cast adrift in 2000 when parent Sturmey Archer collapsed under the weight of financial chicanery. A management buyout put things right and got the wheels turning again at Brooks. In 2003 Selle Royal bought the venerable Brooks firm and has embarked on a campaign of breathing new life into the revered brand while respecting the traditions that have made Brooks what it is. To its credit, Selle Royal not only respected the Brooks traditions but has also moved forward introducing new models and issuing limited editions. Wall Bike, http://www.wallbike.com/, has a good description of the Brooks line. Above is a two part video, in English, showing how Brooks saddles are made. Very interesting. 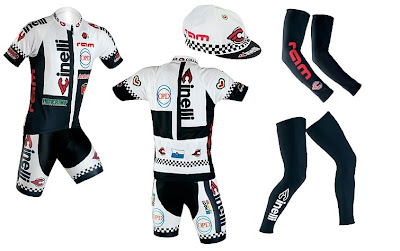 Italian cycling clothes manufacturer SMS SANTINI celebrates its 40 year anniversary this year. For more than 15 years Santini Maglificio Sportivo has been the official supplier and licensee of the UCI for the World Championships, the ProTour, the World Cup, and various European Championships. 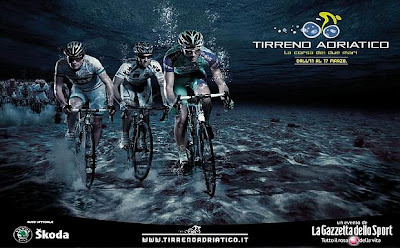 For 10 years they have been the official supplier of the Giro d’Italia leader jerseys. "Rodella 2000" has filmed a video of founder and owner Pietro Santini in which he recounts the history of the company. The video, in Italian, has images of their design and production facility, autographed jerseys, photos, etc. In its coverage of the Tour of California the Gazzetta dello Sport had the wonderful story of Giuseppe Ciccarelli (above, and 3rd fom left in second photo). The story takes place at the BIBA Restaurant in Sacramento the city where the Tour of California started Saturday with a prologue. 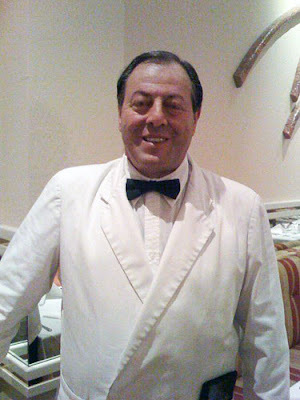 Here Mr. Ciccarelli, originally from San Remo, works as waiter. He reveals that he was a "gregario" (domestique), some 30 Kgs (66 pounds) and 40 years ago, for two seasons in 1969 and 1970 and rode in two Giro D'Italia on the Molteni team with Eddy Merckx. He tells his stories by beginning with, "In my time....."
"In my time we wore wool jerseys that when rain soaked would drag against the rear wheel which is why we would put the water bottle in the front jersey pocket." "In my time we would mix five espressos, a little bit of cognac, and a tablespoon of sugar in a glass bottle for psychological boost." 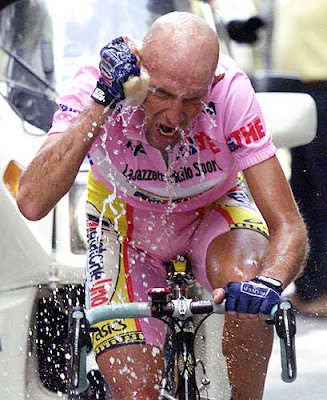 "Do you remember the Savona stage of the Giro when the "Cannibale" (Eddy Merckx) tested positive? In my time I knew him well, he didn't take anything. Remember that in those days if a rider could not get replenishment from the team car they would take a bottles from fans. I believe there was something in one of those bottles." "In my time they unloaded me from the team after two years, after making promises that were never kept." 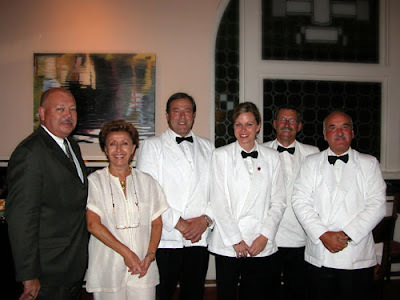 "I became a waiter on a ship, fell in love, and disembarked in San Francisco in 1975. Later I came to Sacramento. I'll go back to visit Italy when I am 62 years old." Concluding his story, Mr. Ciccarelli said, "I will not be going to see the prologue today because it would be too nostalgic." Photos: from Gazzetta dello Sport story; from BIBA website showing also Ms. Biba Caggiano, 2nd left, who was born in Bologna and opened the BIBA Restaurant in 1986. 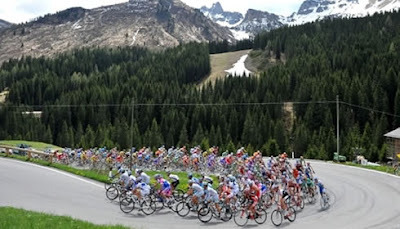 The first Giro d'Italia was organised in 1909 and was composed of 8 stages with a total distance of 2448 kilometres. 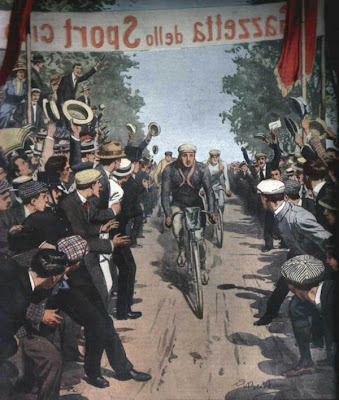 This first Giro d'Italia took place from the 13th to the 30th of May 1909 and was won by the Italian rider Luigi Ganna. At the start of this first "Corsa Rosa", at 2.53AM on 13 May, there were 127 riders, all Italian except for 4 French riders. Only 49 of them finished in Milan. 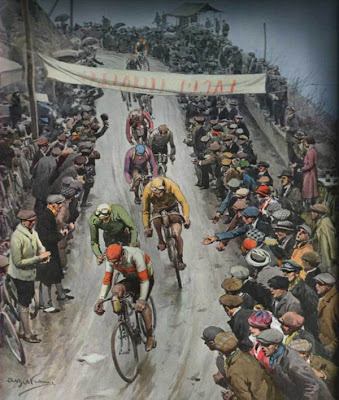 According to the criteria we currently apply to cycling races, the first Giro would have been won by John Rossignoli 24 seconds ahead of Carlo Galetti and 50 seconds ahead of Luigi Ganna. Only in 1914 did the general ranking begin to be based upon on the total time added up on all stages. 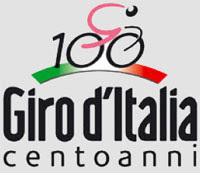 The Giro d'Italia was created following the example of the Tour de France. 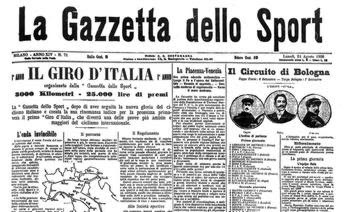 While the Tour de France's goal was to boost the sales of the L'Auto newspaper (which has since become L'Equipe), the Giro d'Italia had the same goal but for the sports newspaper La Gazzetta dello Sport. 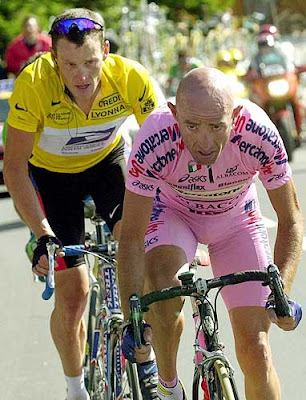 Where the Tour de France has its yellow jersey (based on the colour of the pages of the L'Auto newspaper), the leader of the general ranking in the Giro d'Italia wears a pink jersey since (maglia rosa) 1931 because the pages of La Gazzetta dello Sport are pink. The first pink jersey has been given to Learco Guerra. The Giro d'Italia has since been organised every year, except for the two periods of World Wars: from 1915 till 1918 and from 1940 till 1945. To celebrate the 100th anniversary of the Giro d'Italia the race will finish this year in Rome on Sunday, May 31st. 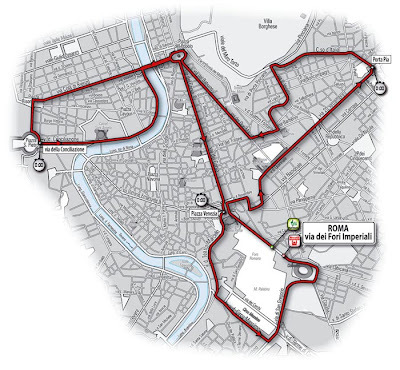 The time trial course start and finish on the via dei Fori Imperiali and will pass such historical sites as the Porta Pia, the Piazza del Popolo, the Piazza Venezia and the Colosseum. 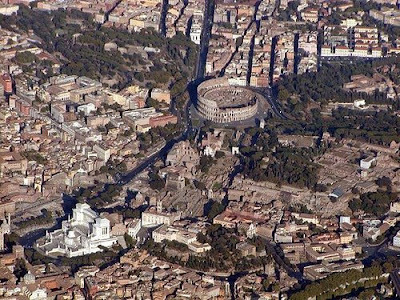 Photos: 1909 artist rendering from Lo Sport della Domenica del Corriere, first Giro announcement in Gazzetta dello Sport, Rome course map, aerial view of Rome, 100th anniversary logo. 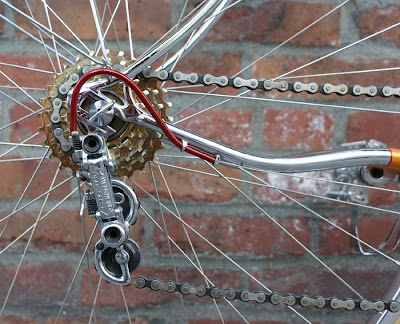 The gains are move obvious, however, with the front derailleur, which moves the chain between the two large, toothed rings on the bicycle’s crank. That is partly because the electronic front derailleur is able to make constant readjustments to reflect changes in the chain’s position caused by shifting with the more frequently used rear derailleur. That allows the electronic front derailleur to use a more efficient shifting mechanism, one that would drive riders to the point of distraction with fiddly readjustments on a mechanical system. 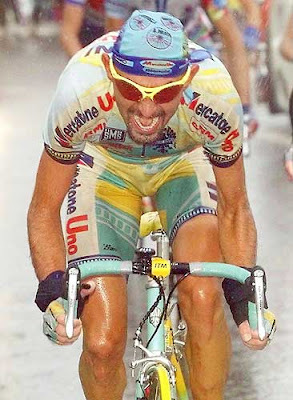 February 14, 2009, five years without Marco Pantani. The combined bike and motorcycle format of the EICMA Milan Bicycle and Motorcycle Exhibition, held in November of the last two years, has not been very popular with all of the cycling vendors. That exhibition had become more of a show with little opportunity for transacting business; EUROBIKE in Friedrichshafen, Germany, had become the place to do business. Today the EICMA announced that the format is changing towards a 3-day bike only exhibition in September followed in November with the 5 day bike/moto show. I was hoping to eventually see the name of CINELLI return to the highest levels of pro racing. 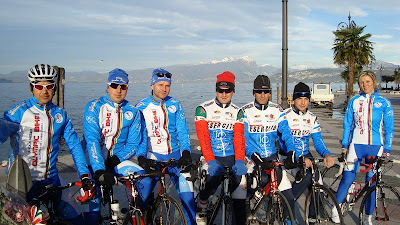 Unfortunately, the Italian Cinelli OPD team is finished before getting there. The team looked good in their black and white kits and matching bikes. 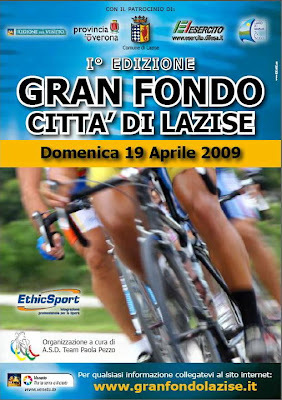 Writing about the new Granfondo Città di Lazise yesterday brought back many fond memories. Lake Garda is such a beautiful lake to ride alongside with its sparkling waters, backdrop of mountains, and elegant lakeside towns. The early part of the route would take you from Lazise to Bardolino to Garda to Torri di Benaco before climbig in the the hills and later Monte Baldo. 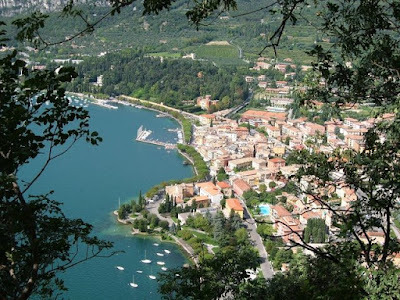 Photos: looking south along the southern west coast of Lake Garda, the small sailboat harbor of Bardolino can be seen and beyond that would be Lazise; the fishing boat harbor at Bardolino, the town of Garda; the harbor at Torri del Benaco, an image of the lake. Photos from the collection of the Hotel Veronello. 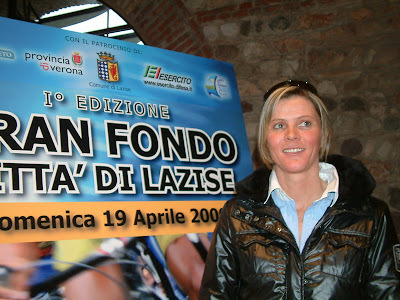 Two time Olympian gold medalist Paola Pezzo, and her Team Paola Pezzo, is the driving force behind the new Granfondo Città di Lazise to be held on Sunday, April 19, 2009. Two routes of 88 and 141 km will be available. Both begin from Lazise, and head north hugging the scenic coastline to Torri del Benaco. At the center of town, off the main road, you turn right and climb towards San Zeno. This road offers spectacular views of the lake, has nice switchbacks and provides a good work out without being unduly difficult. 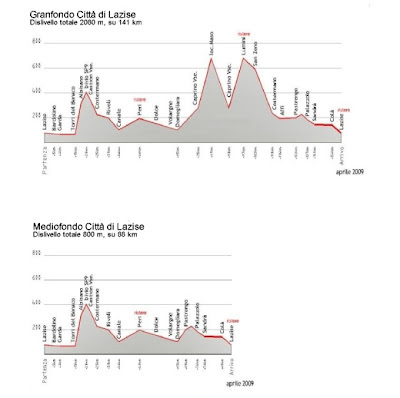 The gran fondo riders will face two additional climbs, each much harder than the 1st as they climb Monte Baldo from east to west. Granfondo Colnago.......in San Diego, CA! 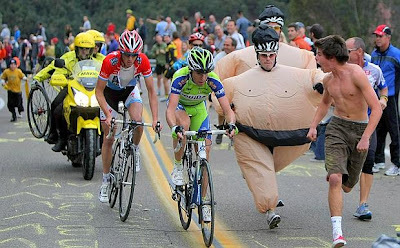 Lance Armstrong Hinting World Record Attempt? Is There A Cyclist at the U.S. State Department?